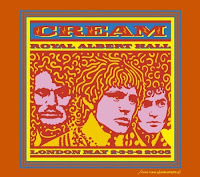 I have to admit that I have had an unnatural attraction for Cream's busy, jittery and bombastic blues improvisations for decades, as they've been a source of pleasure since I saw them first and three-time total at Detroit's Grande Ballroom in the late Sixties. Euphoric recall? Maybe, but I still play the thirteen minutes of "Spoonful" from Wheels of Fire a couple of times a year, and the sheer mania of Goodbye's "I'm So Glad" gets played just as often. The riffs, interweaving, and interjections of the three musicians holding the stage was a busy sort of vibe that was somewhere between musical worlds--too fast and loud for blues, too repetitive and unmelodious for jazz, too arty for rock and roll. It was a sound from the nascent electronic wilderness that was a new kind improvisational sound, influenced by the three aforementioned styles (with occasional garnishes from Classical or English music all traditions), but coming in the end as a new sort of strident, crackling noise; metallic, assertive, all-conquering, sometimes searing when guitarist Eric Clapton was in the mood and made each of his blues intonations speak volumes of what his own voice could not manage.It is something that has less to do with sheer mastery of their respective instruments--in a heartbeat I could name a dozen musicians who are better guitarists, bassists and drummers than Eric Clapton, Jack Bruce and Ginger Baker--but with how the three of these guys gibed and gelled, how well their busy techniques meshed. "Meshed" might not be the right word, but what it gets called, Cream's sound was a wonderful clash of distortion and blue notes, a feedback-laden trio of howling wolves. There is less of that shamanistic howl in the reunion double CD set Royal Albert Hall May 2-3-5-6 2005, which is understandable given that all three members--Ginger Baker, Jack Bruce and Eric Clapton on drums, bass and guitar respectively--are in their Sixties. It wouldn't be incorrect to say that there are enough rousing performances here of old Cream and blues standards to fill one excellent live disc. Still, this is better than any expectation I've had over the last four decades daydreaming in off hours about a make-believe- reunion; the performances are solid for the most part, and I'm glad that Cream's essential duty as performers is to stand there and play their instruments. Unlike the Rolling Stones, whose rebel youth glory days have given way to a routinely graceless stage presence that would make a newcomer to their music wonder what the big deal ever was about these guys, Cream has only to instrumentalize, extemporize, improvise. Again, you wish there was only one disc, as some of the material suffers from obvious nerves, miscues, a lack of direction. There are moments when Clapton's guitar work simply quits in the middle of an idea, with the rhythm section failing to pick it up again and fill the arena with the sort of muscular blues Cream made it's reputation. The best performances, in fact, are the blues number, especially Albert King's "Born Under a Bad Sign" and "Stormy Monday", wherein Clapton vexes self-anointed blues traditionalists yet again with some guitar work that transcends income, nationality, or skin color. It's not a conspiracy against the blues that B.B.King and Buddy Guy have no hesitation saying wonderful things about his playing. The muse is something that moves around and is not at all loyal to matters of class, race or political stance, and in this case the essence of what allows blues music to convince you, at least momentarily, of the universality of a nuanced sort of suffering has taken a home in the center of Clapton's best fretwork. His own solo work in the days since Cream's demise in the late Sixties has been largely wretched pop variations on roots music--please note that Layla is the very notable exception-- but however mediocre a songwriter he has become, his touch on the blues is the touch of a master. "It's all in the wrist" said Frankie Machine, the junkie in Nelson Algren's masterpiece The Man With The Golden Arm as he tries to describe the sort of body finesse it takes to win at throwing dice. It's all in the wrist with Clapton as well, and the fingers as he awards us with one ghostly tremolo and one screaming ostinato after another, the approximation of the human voice emerging from the din of electronic straining. It's spellbinding work, and it is these moments that make the less animated performances on Royal Albert Hall...2005 worth the while. Wasn't Noel Redding in a group called Extra Beans?